This popular open top double-decker bus tour gives an insight into the development of the city. 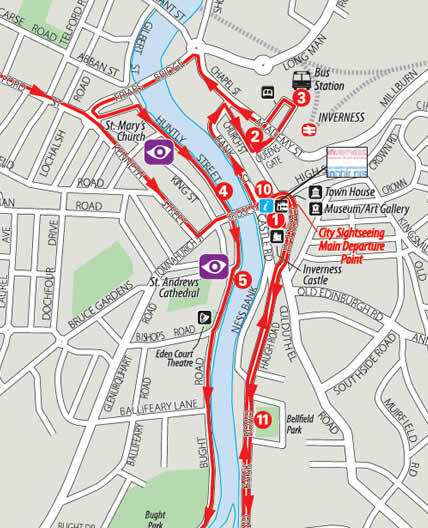 Our open-top bus tour of Inverness departs every hour. You can hop off at stops along the way to explore the places of interest you hear about in the commentary, then jump on the next bus to continue your tour. Your ticket is valid for 24 hours so you can really get to know all about Inverness. Inverness takes its name from the Scottish Gaelic "Inbhir Nis” (the mouth of the River Ness). This ‘Capital of the Highlands’ is known as the administrative, distribution and cultural centre for Northern Scotland and a visitor attraction in its own right. Inverness has grown steadily since King David of Scotland granted the burgh a Royal Charter in the twelfth century. Inverness became one of the fastest-growing towns in Western Europe in the latter part of the 20th century and was awarded city status in 2000 as part of the Millennium celebrations. Today, this welcoming city has a lively, modern feel and plenty to see and do. Your open-top bus tour recounts the story of the city, from the original street between Inverness Castle and Kirk, and the city’s oldest building Abertarff House, to the recently completed Highland Archive Centre. Inverness has had five castles over the centuries with many famous visitors: Mary, Queen of Scots, MacBeth, Robert the Bruce and Bonnie Prince Charlie among them. You can plan your day from the top of your double-decker bus tour. Its 360° degree panoramic views of the city help you decide what you’d like to go and see. Visit the city’s many churches, including St Andrew’s Cathedral, one of the finest buildings designed by local architect Dr Alexander Ross. As you pass the western outskirts of the city, the tour highlights Tomnahurich Hill and the Caledonian Canal. You could hop off for a short cruise on Loch Ness (fare extra), then head for higher ground to enjoy panoramic views of the Kessock Bridge and Black Isle. The final section of the tour takes you by the south side of Inverness Castle to see Flora MacDonald’s statue, the Three Graces, then to Holm Mills shopping village. Tour Highlights: Inverness Castle, Tolbooth, Inverness Town House, Inverness Museum, the Gaelic Church, Flora MacDonald Statue, The Victorian Market, River Ness Islands, Holm Mills Woollen Mill, Loch Ness Cruise (optional), The Caledonian Canal, Eden Court.